Now, if this question was asked to a person living in India, they would probably smirk at you and think you are some kind of a non-foodie alien! For one ‘Curry masala’ is not an Indian spice and two you don’t actually need curry powder to make Indian food!! Did I just raise your eyebrows? Both these statements are true especially when it comes to traditional Indian cooking. You see both the powders are spice blends made with many different spices. Just like Taco seasoning and Fajita seasoning are two different yet similar spice blends used for two different purposes, it is similar to Curry Powder and Garam Masala Powder. Where did Curry Powder and Garam Masala Come from? Although different in many ways than one, there are few similarities between the spices too. I will explain that too for you to make a choice when it comes to choosing one spice for the other. As mentioned earlier, curry powder and garam masala powder are both spice blends. Meaning they are made using different types of spices. Let’s talk about their origination…. Curry powder is the innovation of the Brits. You can read here about the interesting origins of curry powder, so will not go too much in depth. But in short its a spice blend which the British tossed up together to simplify Indian cooking, although the authenticity part may be debatable! Since both the spices are spice blends its obvious that it will be made with different spices. However, like most Indian or any world spice blends, it’s difficult to specify the exact recipe. This is because there is no set recipe for Garam Masala powder or Curry powder. It is very rare to come across recipes that are exactly the same for making Garam Masala or Curry Powder at home or for that matter even commercially bought pre-mixed spice blend. This infographic below will help in characterising and simplifying the most common spices used for making Garam Masala and Curry powder. How Does Garam Masala and Curry Powder Taste? If you read my post on Garam Masala you will know that it is derived from the Hindi word meaning ‘Hot Spice’. Referring to the table above, you will notice that Garam Masala use spices that are sharp that is cardamon, cinnamon, cloves and in some recipes even nutmeg and peppercorn. All these spices together give Garam Masala powder a very strong flavour with a slightly warming, sweet, pungent to taste. Curry powder, on the other hand, is made of milder spices. One of the main ingredients being Turmeric powder. Turmeric powder in itself does not have much taste or flavour although very high in nutritional value. It’s a mild spice. The reason for its use in curry powder is to give a yellow tint to the dish without the need to add any additional spices. The other spices used in larger quantity when compared to Garam Masala are fenugreek powder, cumin powder, coriander powder which are all sweet mild spices. This makes curry powder milder to taste with less heightened flavour. Now that we have a better idea of what kind of flavour each of the spices have, it will make us better understand its use for cooking. Garam Masala can be used both during the cooking process or at the end to give the dish a finishing touch. Adding and stirring Garam Masala at the end of cooking retains and enhances the flavour of the dish. The key to using Garam Masala is that it should be sparingly used. Too much of it may be an overkill of flavours! Since Curry powder is used as an Indian curry spice blend, its used during the cooking process and added while you make the base sauce. It’s also important to cook out the raw flavours of the pre-blended curry mix to avoid an unpleasant taste. If the two spices are so different, then why is it that so many people get confused about them? The reason could be that both these spices have become synonymous to Indian food. Its treated almost like Chinese 5 spice when you cook Chinese at home or like Cajun spice if its Spanish or Cajun-style cooking. The classification of Curry powder and Garam Masala powder as an Indian spice blend confuses many which makes them use it for the wrong purpose. The striking similarity between the two is that they are both spice blends and use almost the same spices, however, the quantity of mild spices such as turmeric, cumin and coriander is more in one than the other. Apart from this, there is no other relatable similarity. Can You Use Garam Powder Instead of Curry Powder or Vice Versa? Now that you are aware of the differences and similarities between the two, the question if you can use one or the other is pretty much valid. Referring to the table of ingredients above you will notice that both contain more or less that same spices. The difference in the recipe is the quantity of each spice used. Garam Masala powder contains stronger pungent spices like cloves, cinnamon, cardamom compared to curry powder, which have mild spices like turmeric, cumin, coriander, fenugreek. This instantly gives both these spices different flavour profiles. Because the flavour profile and taste of the two are different, in an ideal world it should not be used as a substitute. But many people do, due to lack of a suitable alternative or they simply may be unaware of the subtle yet big difference between the two. You may have come across recipes where they use both Curry powder and Garam Masala powder? This is because the spices can be used together in a dish complimenting or highlighting the flavour. The point to remember when using these two together is that you need to use them in moderation. The closest substitute for curry powder will be a mix of turmeric, coriander powder and cumin powder while for Garam masala powder it will be cardamon, cloves and cinnamon. So, my advise to you is NOT to use them as substitutes. If, however you are stuck for better options then there is no reason why you should not. Both these spices are readily available in most large supermarkets these days. Although you may find Curry powder to be the more popular of the two when it comes to shelf stocking. When it comes to buying and using Curry powder and Garam Masala powder it’s important to remember that both have different flavour and taste. Curry powder should be added during the cooking process while Garam Masala powder can be used both as a flavour enhancer at the end of cooking or during cooking. They should not be confused as go to spice blend for making all Indian dishes. They are used to make certain dishes either adding just one of the blends to the dish or both in moderation. 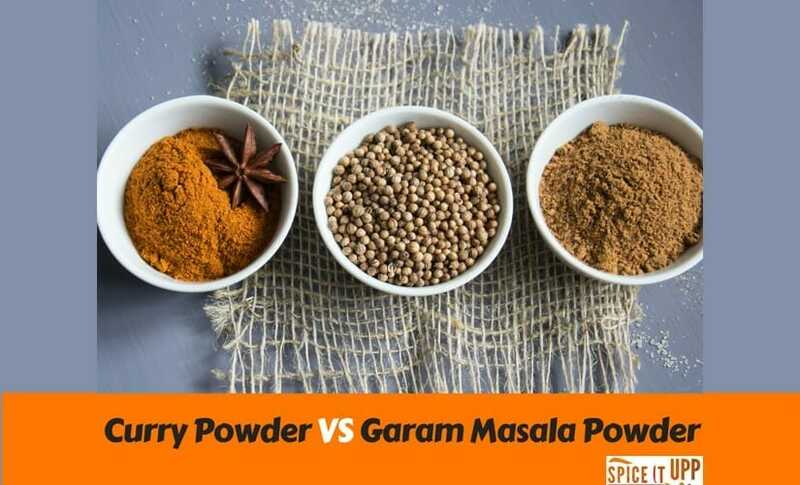 If you have been wondering about the difference between Curry powder and Garam Masala Powder, I do hope the above has clarified the confusion. Let me know if there are any other spices you get confused about. Will write something for sure! What a great idea to make your own and then its so much more fresh and econmical! The taste too is great! Just a spoonful makes a lot of difference. Wow! This is great tutorial! I knew that curry powder were different, but didn’t know how! Thanks for this thorough lesson! Glad you found it useful 🙂 ! I love using spices in my recipe as they add so much flavor. Thanks for sharing this informative post.